I have the exact same ailment which seems to be getting progressively worse. I take 13.5mg of warfarin per day due to multiple blood clots, which has in effect cause much of the problems in my legs. I suppose, my venous issues are compounded with varicose veins which have increasingly developed due to incompetent valves. I have seen many GPs who are seemingly baffled at how to manage my condition. The prescription so far has been compression stockings which I have learned actually cut off the circulation and cellular respiration in the legs causing ulcers to remain open indefinitely. I have since banished the stockings and applied zinc oxide regularly which has healed up the ulcers. 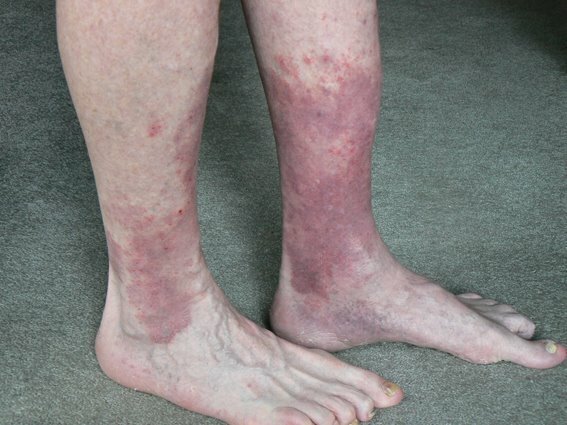 Now I am left with the red necrosis like the gentleman in the above link, which is slowly creeping up my legs. If I could get the condition that gentleman's legs healed to it would be heaven! A few years have passed and I can report that the gentleman who owns the legs in this photo is now well into his 70's and his legs are better than ever. He is a regular walker and in good health. When he first came to see me, he was in distress and I was shocked at the state his legs were in. My, how things have changed! 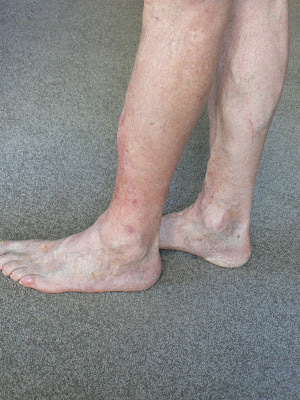 Let's be real about this condition: It is indicative of seriously poor circulation to the legs and this may be a precursor to eventual lower leg amputation. To beat it, we can not afford to mess about. The nutrition interventions I may recommend depend upon each individual's special circumstances and must also be mindful of what medications they may be on. For example: Vitamin E may augment the anti clotting effects of Warfarin, so the obvious action is to reduce the amount of Warfarin if we decide to give you vitamin E (This may need the cooperation of your Dr). The big breakthrough, of late, is iodine deficiency which we can now test for. By far the best first action is to obtain a Hair Tissue Mineral Analysis (HTMA) and possibly a Thyrodine test (contact me by phone to discuss). I am not keen on giving you a "One Size - Fits All" list of advice for a serious health issue. We must get it right. For example: You may be lacking zinc but you may actually have too much; you may need more vitamin C but then again it may be copper you need more of. You may have far too much calcium in your soft tissues and not enough magnesium. Do you need more fat and protein? Who knows? The only way we can know for sure is through the HTMA. So, the first step you will need about a gram of natural undyed hair that you send to Pacific Health. The process of analysis takes 3-4 weeks from the date you send in the hair sample. Once you have your copy of the report you need to contact me to arrange a time to go through the report together. If you do not live in Wellington, New Zealand, then we can do this either over the phone or with Skype (I prefer Skype). Oh! - It might be worth taking several photos of your legs so that you have something to refer to in a year or so from now. Improvements can be very subtle and easily missed. Photos do the job well and can be matched with other measures such as distanced walked with comfort. The advice in these articles is given freely without promise or obligation. Its all about giving you and your family the tools and information to take control of your health and fitness. Please give me your support by subscribing to my free email updates. Please encourage your family and friends to do the same. While we may not always be able to compete with the big operators on price, we aim to more than compensate through personal service!